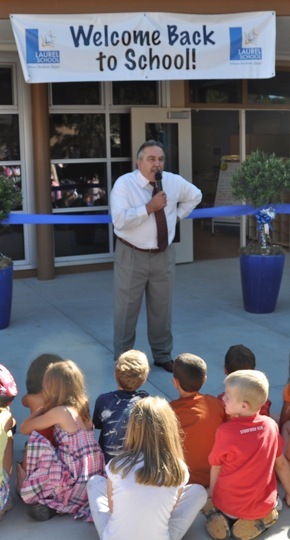 Laurel School‘s $11 million campus revovation made its official debut this morning at a ceremony overseen by Ken Ranella, Superintendent of the Menlo Park City School District, including school board members and a host of others involved in the project. Laurel School Principal Linda Creighton did the ribbon cutting as an appreciative crowd of students and parents applauded before touring the campus – and catching up after a summer off. The renovations were made possible by Measure U, the $91 million school facility bond measure that was passed overwhelmingly in 2006. That begun a planning process that looked at the anticipated jump in student enrollment at the district’s schools. As part of the response, school boundaries were realigned and renovations began at Laurel, Encinal, and Oak Knoll schools. The rebuilding of Hillview Middle School has just begun. In his remarks, Ranella noted that enrollment at the district’s schools – which stands this year at 2,630 – is already exceeding projections. The Laurel campus reconfiguration and renovation includes a new third-grade pod of five classrooms, specialty art and music buildings and an upgrade of the playground structures and fields (the latter a work still in process.) School opens tomorrow (8/24).